Like the famous sauce, Sriracha seasoning is also available in powder form. At Magic Plant, we make Sriracha Powder from freshly harvested red chilies. Then we compliment them with garlic. We then add a dash of vinegar. And add a pinch of salt. Finally, we add sugar. The result of using these ingredients is in fact, a perfectly balanced Sriracha Powder blend. 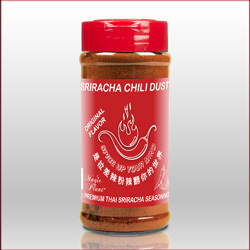 Our spicy powders bring traditional Sriracha seasoning to your foods. Additionally, this flavor is packaged in a two-ounce Magic Plant shaker jar. Si Racha is a city in eastern Thailand. This is where Sriracha was created in the first place. Originally it was added to dishes served at local seafood restaurants. Sriracha is an amazing flavor that starts with red hot chilies and garlic. Then add white vinegar, salt, and sugar. The Korean cuisine includes a variety of Sriracha flavors. Additionally, so does the Vietnamese, Thai, and Pan Asian cuisines. The unique taste comes from spicy peppers with distinct notes of vinegar and garlic. Mix Sriracha Powder with mayo to create Sriracha mayo dip. Start with Sriracha. Then add red wine vinegar, ketchup, and honey. It’s a delicious Sriracha BBQ sauce. Add Sriracha to oil. Add chopped dried thyme. Enjoy your amazing wing sauce. Mix it in with any rub or sauce mix for a flavor pickup. Our Sriracha seasoning powders are packaged in 2oz spice jars. Purchase them ready for retail, or in 50 lbs bulk packing. Sriracha seasoning remain fresh for about 6 months when stored under the proper storage conditions. Store in a cool, dry place not to exceed 75℉ and 57% RH. Storage areas should avoid exposure to direct sunlight. As of today, restaurants around the world serve foods including Sriracha sauce. Some serve it as a condiment. Others include a bottle of it on the table. Magic Plant offers 2-oz Sriracha Powder in a ready for retail spice jar which includes a sifter lid. Please contact us for Sriracha Powder bulk pricing. The popular Asian hot sauce is now available in powder. Magic Plant makes its Sriracha seasoning using only high-quality ingredients. As a result, you can taste the difference! Try our original Sriracha seasoning flavor available in 2-ounce jars. It’s also available in bulk packaging. Sriracha is a universal seasoning used to spice up foods. Purchase our original Sriracha Powder seasoning. Then add it to your favorite dishes. Use it sparingly. Or use it as plentifully as desired. It’ll add a kick of flavor to sauces, dips, fried dishes, and casseroles. Buy Sriracha Powder retail and wholesale. Let our Jamaican Sriracha seasoning rock your taste buds. First, we took our original Sriracha. Then we added Jamaican Scotch Bonnet chilies. As a result, we created a spicy taste treat. We combined hints of Asian and Jamaican tastes. That’s how we created a flavorful Jamaican Sriracha. Consequently, you get to enjoy the unique blend of both cuisines. Imagine these two flavors at the same time! 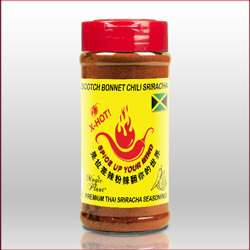 Add Jamaican Sriracha seasoning to your main dishes, soups or casseroles. We think you’ll enjoy this flavor combination. It is a bit spicy, but a little bit swee. And it’s packed with flavor. Buy Jamaican Sriracha powder retail and wholesale. 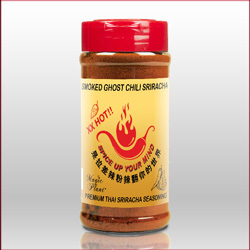 What do you get when you blend Classic Sriracha flavor with smoked Bhut Jolokia? You get a punch of heat and a blast of flavor at the same time. In addition, you get just a tad of smokey flavor. Magic Plant Farms developed this unique smoky flavor for Sriracha fans. Ultimately, you get to enjoy original Sriracha flavor along with hot smoky heat. Today seems like a good day to try our smokin’ hot version of this seasoning. You will not be disappointed, we guarantee it! Buy Ghost Pepper Sriracha Powder retail and wholesale. In 2011 the Scorpion pepper reigned as the hottest pepper in the world. Although it has since been dethroned, it is still hot! Are you ready to try a new flavorful blend? We combined Classic Sriracha with pure Scorpion Pepper Powder. Trinidad Scorpion Sriracha seasoning provides a unique combination. It has an amazing Caribbean taste. But it also has a kickin’ heat. Sriracha fans will enjoy the combination of Caribbean and Asian cuisines. Trinidad provides intense heat. Then actually offers sweet citrus-like undertones. Magic Plant Farms offers a unique, spicy sensation. It’s not found anywhere else. Buy Trinidad Scorpion Powder retail and wholesale. Do you love hot peppers? Then you’re going to enjoy this taste adventure! Magic Plant Farms combined Classic Sriracha with pure Moruga Scorpion Powder. As a result, the final product turns out sensational! 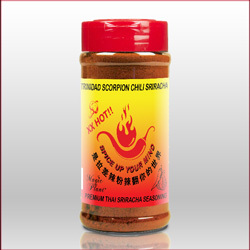 Moruga Scorpion powder provides the heat. On the other hand, sriracha brings the perfect flavor blend. Whether or not you are a pepper head, you’ll enjoy this hot blend. Furthermore, it’s packaged in convenient 2-ounce shaker jars. Sprinkle it on foods in the same way as regular Sriracha seasoning. Remember to start sparingly. Then slowly increase as your tolerance to hot and spicy foods increases. Buy Moruga Sriracha Powder retail and wholesale. The Carolina Reaper is, “the hottest pepper in the world.” Additionally, it’s not likely to be dethroned soon. 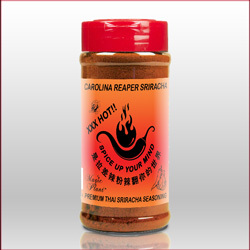 This product is for those who like classic Sriracha flavor but also enjoy the Reaper’s heat. Magic Plant Farms’ creation combines original Sriracha with pure Carolina Reaper powder. As a result, we created an unimaginable flavor combination. Ultimately, it’s going to take you to a new taste dimension. Are you are a chili pepper lover? Or perhaps you just started your pepper journey. At any rate, you’ll love this flavor explosion. Finally, a word of caution. Use it sparingly at first. Afterwards, increase it. In any case, be sure you can handle the heat! Buy Carolina Reaper Sriracha retail and wholesale.